The Ultimate One-Two Punch! This offer includes one 32oz Bottle of Injector Pro Clean and one 32oz bottle of One 4 All with Lubricity. 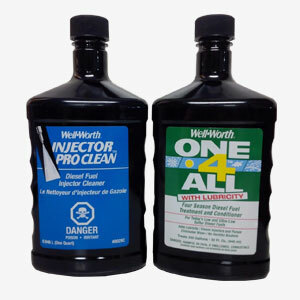 1-32OZ Bottle of INJECTOR PRO CLEAN and 1-32OZ bottle of ONE 4 ALL with LUBRICITY, The magic combination. It is Rare in this Over-Hyped marketplace to find a product that actually works, but Injector Pro Clean will make you a believer! I have sold this product to Cat, Cummins, Duramax, Detroit, Mercedes Benz, International, and PowerStroke owners, and all have had incredible results.....SAVING THEM THOUSANDS of DOLLARS!!!! If you have a Noisy Injector, Pulsing RPM's at Idle, Smoke at Start Up, Drop In Mileage, Overhaul Poor Performance, and maybe you even took your diesel to the shop and they ran a balance test....before you order new injectors and spend $$$$, try Injector Pro Clean and One 4 All with Lubricity first! I had every symptom above on my 2004.5 Duramax LLY with 240,000 with original injectors and pump. I located the two bad injectors, and was ready to place the order when I discovered a video about Injector Pro Clean. It was an easy decision; try a $35 solution or order the injectors with core charge for over $1200. But I also have to tell you, I did not follow the directions on the bottle. I bought a new Fuel Filter, and filled it with Injector Pro Clean, re-installed the filter, poured the remaining bottle into the fuel tank, I had 10 gallons of fuel in the tank. I started it up and it chugged and smoked, I ran it at 1200 RPM until it cleared up, WOW, and an immediate difference. Then I drove it a couple hundred miles until I needed to fill the tank, then filled it up and added the second Well-Worth product, ONE 4 ALL as directed on the bottle. I continued to treat with ONE 4 ALL until the quart which treats 250 gallons was gone. Every time I drove my truck, the performance continued to improve, and the injector knock is completely gone. I would recommend that you purchase enough Injector Pro-Clean to fill all your fuel filters, and enough One 4 All to add every time you fill up. ONE 4 ALL with Lubricity is the perfect all year solution for your Diesel Engine. It is also the perfect follow up to Injector Pro Clean and highly recommended. In today's world of Ultra Low Sulphur Diesel Fuel, adding LUBRICITY is a must to prevent premature injector and injection pump failure.ONE 4 ALL is an ALL SEASON, Organic Based Product formulated to Add LUBRICITY to Low and Ultra-Low Sulphur Fuels. 1-32oz bottle will treat 250 gallons. If you have obvious Injector Issues, Treat with INJECTOR PRO CLEAN, and follow up with ONE 4 ALL for Incredible Results!